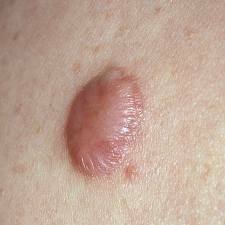 A keloid is a thick scar that is composed of densely packed collegen. It is a result of overabundant scar tissue at the site of a skin injury, such as after surgery. Keloids are firm plaques or nodules that can be itchy, painful, and tender. They often occur after a piercing or at the site of a surgical procedure; however, they can even occur from something as simple as minor trauma or abrasion of the skin. Sometimes they even occur spontaneously. Keloids can occur in anyone, but are more commonly seen in African-Americans. They can occur anywhere on the body but tend to be most common on the upper trunk area, around the shoulders, and on the upper arms.